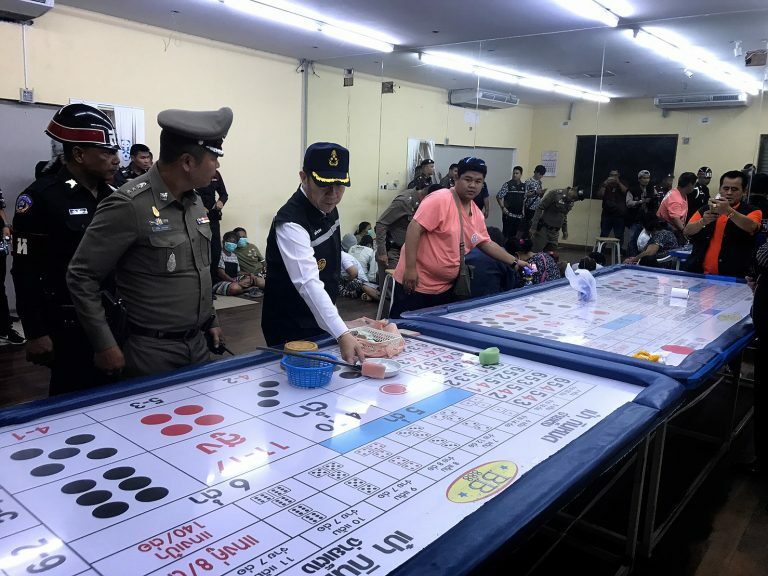 A video showed the aftermath of a bust on a three story premises in Pattaya Sunday when 17 male and female gamblers were caught playing the dice game Hi-Lo. Local station chief Aprichai Krobpetch and Bang Lamung district chief Naris Niramaiwong led the military and other agencies in the raid. Several Hi-Lo tables and associated gaming equipment on the ground floor were taken into evidence along with 10,000 baht, reported INN. The gamblers - with face masks to protect identities - were led out in a conga and loaded onto pick-up trucks for their trip to the police station. A man called Wongdech Hirachwisit. 37, admitted that he was in charge of the operation. Why is this allowed? I suspect it is to protect the payers of bribes to Pattaya Plod from any investigation. Black t-shirt broke the conga line. He's got to pay at least 50 baht more. Another family draw card to the resort wiped out! Didn't that place used to be a big Indian restaurant ? why they don't legalise it is beyond me....after all they allow the National Lottery and bets at horse races and boxing matches. Some really beautiful women in that video. I thought it wasnt allowed to carry passengers in the back of a pick up! Here they resort to simple plastic sheets and hide out at some shacks in the paddy fields. Police takes the bribe and leaves them alone. If police gets aware they will even warn when the military is on the way. But sometimes the military gets them. After the conga comes the oki koki . Ozzies better watch out, on ANZAC Day coming up - as TwoUp will surely be targetted next!